These are the DMing rules that I follow. Some of them have evolved from my own experiences while others were passed down to me from my uncle, who started teaching me how to DM in 1980. Never control your player’s character. If the characters hear a noise behind them, try to avoid saying “you all hear a heavy growling behind you and turn around to see what it is“. Even though the characters are almost definitely going to turn around, you don’t have the right to take control of the party by doing it for them. However, waiting for each and every one of them to tell you that they turn around, usually by saying “well duh, obviously I turn to see what’s growling” can get tedious. Instead, say something like “you all hear a heavy growling behind you. Those of you who turn around see a snarling, hairy beast as big as a horse“. At this point, it’s safe to assume that all characters have turned around, because honestly, who wouldn’t. But you’ve left full control of the characters with the players which will add to the quality of the game. You wouldn’t let them tell you which direction the wind is blowing in your world, would you? However, you can control their involuntary reactions. You can tell them that they’re shivering due to the cold or sweating due to a failed bluff check in a tense situation. “You slice through the orc’s belly, causing greenish, yellow guts to spew outward. He drops his axe, clasps at the wound and looks up at you with fear in his eyes before collapsing face first onto the dusty ground.” This doesn’t have as much information as the previous description, but it keeps the game flowing and doesn’t make your players wait for you to finish. Although this next tip may not be for everyone, it’s greatly improved the quality of my games over the years. With this card, Danielle could see exactly what she did and didn’t do to earn XP during the previous game and in what order it took place. Aside from giving her a kind of receipt, the cards also act as a sort of simplified journal that players can keep and look back on. A record of everything they’ve done over the years. In my games, I awarded 100 xp for talking to NPCs at some length and with some level of in-character conversation. You can see here that The Hummingbird had a couple of conversations. The 125+100 xp is in two parts. 125 for impressive roleplaying (this goes beyond standard conversations with NPCs) plus 100 for performing a class based action. Since she was a rogue, picking a pocket qualified her for this. If she was a cleric, healing someone’s wounds would have gotten her the XP. This bonus could never be awarded more than once per game and was only given if the action had some kind of beneficial effect. For instance, if a wizard realised that the game would be ending soon and so cast Magic Missile at a tree in an attempt to quickly grab that 100 point bonus, he’d be out of luck. The 350 xp was a standard “defeating a dangerous, dungeon room” bonus that I always gave and yes, that’s how “The Dounut Room” was spelled. There were many more ways to earn house-ruled XP as well. I suppose that’ll be my next tip. The top left corner shows the card’s number. I noticed one day that all the players were numbering there cards to keep them in order and so I started doing it for them. This also helped with record keeping. 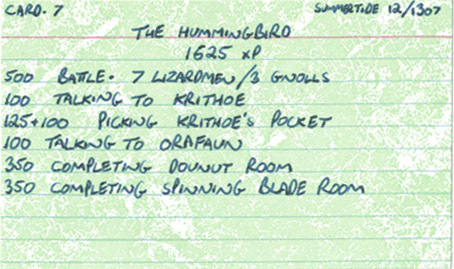 Even though Danielle hasn’t played The Hummingbird in years, I know that she played forty one games of D&D with that character because I have forty one XP cards here on the table. The top right corner shows the in-game date that the gaming session started. This would help players keep track of how much in game time was passing. Sometimes it’s hard to remember if your character fought that flying crocodile two ‘in game’ days ago or two ‘in game’ months ago, because it may have happened three months ago in real time. Another advantage to having the cards is that players can point out any mistakes I may have made. Being human, it’s not impossible for me to miss something point worthy that a character had done and therefore not award any XP for it. With the card, the player could call me on it, discuss it, hit me with something heavy and get the points he deserved. It should be very easy to find thick packs of blank cards (sometimes with cool, green marble patterns on them like the one above) at most dollar stores. They cost about… well… a dollar. Encourage everyone to take short breaks. I used to work as a blackjack/poker dealer and every casino forces all the dealers to take one fifteen minute break every hour (not all at the same time, of course). This is because it’s been proven that after an hour of concentration, the average brain starts to slow down and make mistakes (and slow dealers cost casinos money). Now you might not be required to be on your mental toes as much as a dealer, so you probably don’t need that many breaks. My personal preference was to take a ten to fifteen minute break every two or three hours. Get up, stretch your legs, talk about something other than hit points and realise that the “Funions are stuck in the machine”. Then you can dive back into the game, fully rejuvenated.